The mystical totem has been stolen from our village; can you retrieve it before it is too late? Click here to play! There are plenty of cash winnings on offer if you manage to capture the relic in time. Totem Treasure is an exciting 5-reel slot played across 5 pay lines, where the more lines activated will increase your payouts on winning combinations. The Squaw is Wild and can be substituted for any other symbol on the reels in winning combinations. The Eagle is the most lucrative of all symbols and if you manage to capture 5 of them on an active pay line you will find yourself with 12,000 times your initial wager. There are no bonus games to distract you from massive winnings, so you can play for the big jackpots on every spin! 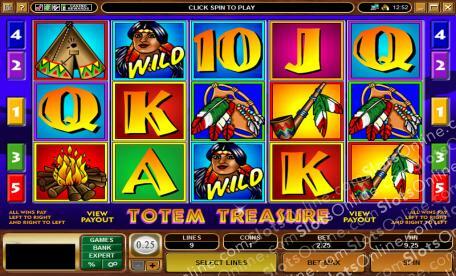 Totem Treasure is an exciting slot that is sure to keep you coming back for more! The Squaw is Wild and can be subsituted into a winning combination by acting as any other symbol on the reels.